FROM THE SOLE: NEW FOOTBALL BOOTS - WHY ARE WE WAITING? NEW FOOTBALL BOOTS – WHY ARE WE WAITING? If there’s one thing we’re having to do progressively less of in life – it’s waiting. I want a film? I can download it to my Xbox or PS3. I want Music? I stream it off Spotify. So why do I have to wait 4-6 weeks to buy a new pair of football boots after I first see them? 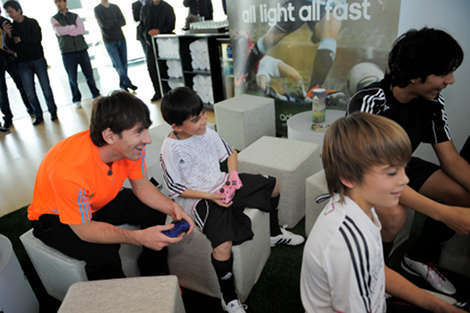 Messi at the adiZero 'Speed Week' event, a full 4 weeks before their retail launch! Whilst I’m lucky to be a member of the Footy-Boots.com team, I’m also a huge fan of football boots full stop, and I’m as keen as anyone else to get my hands on a pair of new cleats and see what they’re like in the flesh – so why is there such a big waiting period between the reveal and the retail release? adidas have to be one of the worst culprits when it comes to prolonged teasing periods. 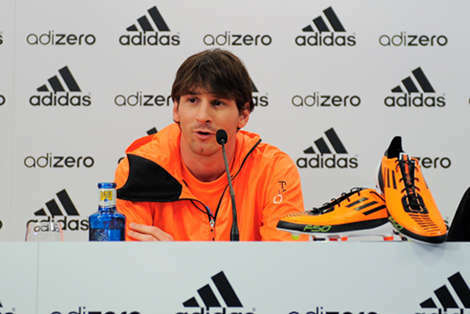 Take, for example, the new adiZero Prime – unveiled on New Year’s Day, but you couldn’t buy a pair until the 15th of February. Compared to Puma – who reveal their football boots on the day they hit store shelves, and their new boots usually debut on a Saturday – which means you’ll also see them on the pitch for the first time on release day, too. Whilst the fan in me wants the boots as soon as possible, I can’t help but wonder – which method is best for a brand to sell more football boots in the long run? The first image we posted of the Prime - way back on January 1st! The advantages of an instant release are pretty obvious – a potential buyer sees the boots on their favourite player’s feet, or on a high-quality football equipment-based website and they can click on a link or go to a shop and buy them straight away. As I said at the start of this piece, I think the age of hyping something up – like a new colourway – is slowly losing it’s effectiveness, and many people prefer to see something and buy it as soon as humanly possible. Though I imagine that this approach is also more complex to pull off from a logistical point of view – not only do you have to make sure that all players and retailers have the new football boots well in advance of release to break in as they see fit and get ready to go on store shelves, you also have to contend with people boot-spotting your new colourway on the training ground, or retail employees leaking them onto the internet. Product confidentiality is not the only area where the ‘instant release’ tactic has weaknesses; there’s also the matter of advertising your new football boots. 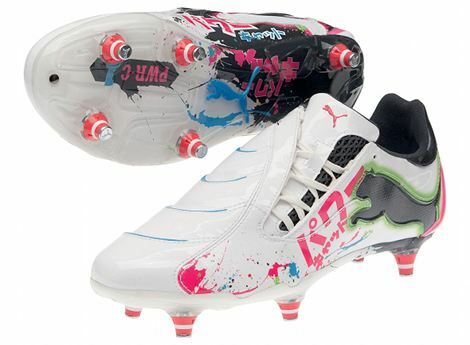 Puma's PowerCat Tokyo was revealed on February 9th. The same day they landed in stores and Buffon & Sagna wore them in international friendlies! Going back to the adiZero Prime example, in the 6 weeks between reveal and release adidas not only had their biggest players wearing their highly-visible new football boots on the pitch, they also managed to launch not one, but two advertising campaigns (Speed Week and the new ‘The Lightest. The Fastest’ videos with Messi & Nasri) and numerous other virals. The danger here, is that a prospective buyer who is considering the adiZero Prime as their next pair of football boots will go to buy them, realise that they’re not out for another month and go and buy an older model; or even worse, a boot from another brand altogether! I also think that after 6 weeks, boots have lost a bit of their ‘Zing’. I’m sure I can’t be the only one that felt like they’d seen so much of the adiZero Prime when it finally landed in shops in February, it felt like it had been out for months already! After 6 weeks of seeing it on the pitch, watching the ads, reading articles about it and catching interviews with players promoting it – the Primes didn’t feel that new when they finally came out. One week after the retail launch, some players were already wearing a new colourway - is this fair? My suggestion would be simply for brands to have a shorter period of waiting for their football boots – something around the two week mark would probably be about right, in my opinion. Or if they feel they have to publicise their launch for 6 weeks, offering some sort of pre-order incentive would go a long way to making sure fans aren’t tempted to buy from another brand while they wait – a ball, boot bag or training top surely can’t be that hard to throw in when you’re charging £210 for a pair of football boots! But as always on Footy-Boots.com, it’s what you think that matters most! Do you want your boots as soon as you see them? Or do you enjoy the hype? Even better – have you got a perfect scheme to get brands to advertise their boots, whilst still keeping eager fans happy? I could not agree more. I know that when I see a new pair of boots I want them right away, I’ll check out my favorite retailer to find out I have to pre order them and wait for about a month, it just isn’t fair because if I do pre order them by the time the month is up and they’re available a new colorway comes out that is nicer and I just paid â‚¬200 for new boots. It just isn’t fair. While the point made about Puma releasing their items on the same day as they hit shelves has it’s downfalls with respect to confidentiality but what information is kept secret nowadays? If you go on YouTube right now they have images of all of next years kits and the new Superfly III and what not, so confidentiality flaws hit every brand the same, it just doesn’t exist. Adidas does well in hyping up their products as well as Nike and should lessen the amount of time it takes to get a hands on. 2-3 weeks is more than enough time to have everyone drooling over new products and by hands on time everyone is still hyped up and is up to date with the latest colorways. In the ends it’s what we all want. To be up to date. It bugs the daylights out of me. I follow Footy Boots daily and love seeing the new boot releases, but when I see something I like I want to buy it now. Like you said, when you have to wait 6 weeks before the boot is released, it seems like its an old boot and loses its appeal. So I say launch the boot as soon as possible brands. It’s called marketing. Building a boot up, teasing it, then making people wait for it. 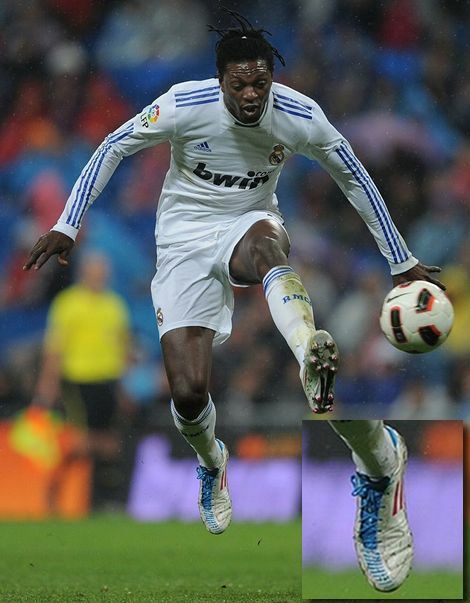 Otherwise, like with Puma, many of the boots just slip away and get forgotten about. Trust me Adidas and Nike know what they are doing. Guys, it’s madness to assume the entire boot-buying community are boffins who check sites to know about a boot’s release. 2 weeks or 6 weeks, they’ll still buy the boots when they get released. They are up for pre-order on many places anyway well before release. Seeing them on the feet of the players is to be expected and will whip up the desire to get them if anything. If I see a boot I like, the fact it hasn’t been released yet is hardly a deterrent. A boot is to be used for months if not years so a month’s wait for the pair I want is hardly an issue. I don’t think this “delay” is a big deal at all. What is more alarming is the rate at which new boots are coming out. thanks god something like this never bugs me. i’m a fan of black heritage boots, and i don’t mind if it’s a tiempo or adipure (king is hard to find here), even after 6 months or a year after their release, i could always get a pair. since only a few ppl go after them. i think the point about the stars wearing the new colourway already is quite pertinent. unless of course you get a 50% discount on the old ones while they begin wearing the new ones! haha. anyway – i’ve learnt to just wait 1 year before buying a new boot. 50% off is just too good to resist. I’ve got the CTR360, v1.10 and Mizuno wave ignatius – all for the price of a full fledged adizero. I get to pick and choose which boot I want to use for the match – can’t beat that. @Mo: there are many different methods of marketing; this is one of them, sure. but i don’t think that this method will last forever. one or two years puma getting all the hype? who knows? nobody expected the wave ignitus but look where mizuno are getting now. @kuuku: so true. when i’m already in love with predator XII, it doesn’t mean that i’ll get T90 III just because adidas are taking their time with the release. of course it’s FRUSTRATING we have to wait all that long for a new goddamn boots to hit the store, but it’s just footy-lovers screaming their hearts out. it was never a threat for big companies. so yes, it’s our problem. not theirs. do i agree with this article? i agree with all my heart. but could we do something about it? maybe threaten the companies that we’ll buy from other brands? no. we’re stuck in the same ship brother. for me, what’s more frustrating than waiting for the boots, is waiting for the right colorway!!! those of you who’ve been through “F**K!!! this new colorway looks way better than the one i’ve ordered!! !” give me a thumb up. I completely agree with this article and there is definetely smt wrong with Adidas’s production and distribution plan. Correct me if I’m wrong but the green/pink adizero I hit the shelves after the adizero II was officially announced. I believe the rate of color releases are already out of control, but at least nike is doing it in a more organized way. For example, the leather adizero II in orange is not available on prodirect but is sold in soccer.com for US customers. Rapid color changes effect buyers and we have to face the fact that our boots will be old fashioned and devalued in 1 or 2 months. Even if we don’t like that pink mercurial and want to stick with the green cactus colorway, the damn thing looks good after a few games on the feet of famous players. I believe in the near future players will pick a favorite color for their boots and play with them until the new boot comes out. For example, Torres should be allowed to play in whites or why should Fabregas play in a different color than white/red maestris which fit perfectly. In attempts to have players switch as a new color comes out like C. Ronaldo, they turn the players into clowns. I believe players should be given a chance to choose a favorite color and play with them from the beginning after all there are nomore colors left to discover that we have not already seen.